At 7:15 this morning, yet another crude oil train erupted into an inferno, this time near a small town in central North Dakota. As these wildly dangerous trains continue to explode—at least 10 in the last two years—it’s become challenging to keep track of them all. So, for the record, we’ve assembled here a pictorial timeline of North America’s bomb trains. Last week, the Obama administration adopted new regulations that will phase out many of the most hazardous tank cars over the next five to six years. The regulations also substantially reduce public oversight of train movements and industry behavior. We will update this post as new explosions occur. Like what you're reading? Watch Eric de Place discuss the costs and consequences of oil trains here. I live in OtisOrchards, Washington(Spokane County, about 2 city blocks from the rail lines.These trains pass through Spokane County and city each and every day and night. some 100 cars long.Heavier at night.we are the gate way to the Pacific. The rails go straight through this city. It’s frightening to think of a derailment.Some cars up to 6 or 10 are just left on the tracks for weeks. They say the oil trains are going to bring more and more as time goes. I pray this is stopped or routed outside of public areas. I’ve actually noticed an increase in the disturbance of my sleep because of the heavy rumbling coming from both the Union Pacific and BNSF tracks. It’s pretty loud for all hours of the night. Loud enough to wake me up. It usually sounds like thunder that rumbles continuously for several minutes. If an explosive derailment happens on EITHER set of tracks (I’ve witnessed 1267 bakken oil being transported on both tracks) my whole neighborhood will be destroyed, including the elementary school directly adjacent to the north set of tracks. God forbid a derailment happens during school hours, over 300 kids are enrolled in that school. I’d encourage you to check out our article on the health impacts of oil by rail because there is a section on how these sleep disturbances elevate stress hormones and contribute to decreased cardiovascular health. 1267 doesn’t necessarily mean its Bakken, only that its petroleum crude oil. The placards don’t distinguish between Bakken or crude from any other source. Few other notes, generally if your town has a railroad going through it, the town was built around the railroad not the other way around. Saying the railroad should move to a less population dense area doesn’t make sense, railroads supply industries, industries supply jobs, people live near jobs, losing the railroad would probably begin a long steady decline of your area. If the railroad stops hauling the oil completely (which they’re actually required by law to haul it and can’t say no) it will start being hauled by trucks on the interstate. Wanna take a swing at what truck vs. railroad accident rates are like? Sure trains carry larger amounts but that’s like saying you’d rather have someone shoot at you with a shotgun rather than a rifle cause the BB’s are smaller. People over inflate this issue because when it happens it makes exciting headlines but of all these accidents how many people (outside of railroad employees) were injured? In the United States, I’d bet $1,000 it’s under 10 if its any at all. Still these stories make exciting headlines and fit into the media’s current goal of doing everything they can to make you feel unsafe no matter where you go, so I can see why they get published. One can only imagine the massive public outcry if this number of airlines fell from the sky in the same amount of time! These 100 car trains need to be halved and slowed down. The coupler forces on a 100 car train dizzies the imagination. Warren Buffet won’t go to the poor house adding additional train crews. In fact, he’d add to the employment numbers! My bedroom is 40 yards[120 feet] away from the main east west line of Union Pacific. I see 20 plus trains,of 100 cars each a day; grain, lumber, fresh produce and frozen, as well as many of the new really large oil haulers. If a train derailed or exploded in our ‘little’ town the whole place would go up and i could just bend over and kiss myself good-by…. I advocate for clean air, soil and water, and for renewable energy, because if we continue with fossil fuels, we are risking the lives of not just communities, but the future of our planet. We must stop polluting and start restoration. You know what would stop something like this? A huge oil pipeline between the US and Canada! Oh wait. Government ruined that. That’s great mob boss reasoning: build us a huge and totally unnecessary pipeline or else we’ll blow up your town. It’s good to know what the oil industry thinks of us. It’s not a threat–it’s a fact. Pipelines certainly have issues but they don’t exploded in cities and towns, killing people and destroying homes and business. It’s seems patently ludicrous to me that people are protesting pipelines. 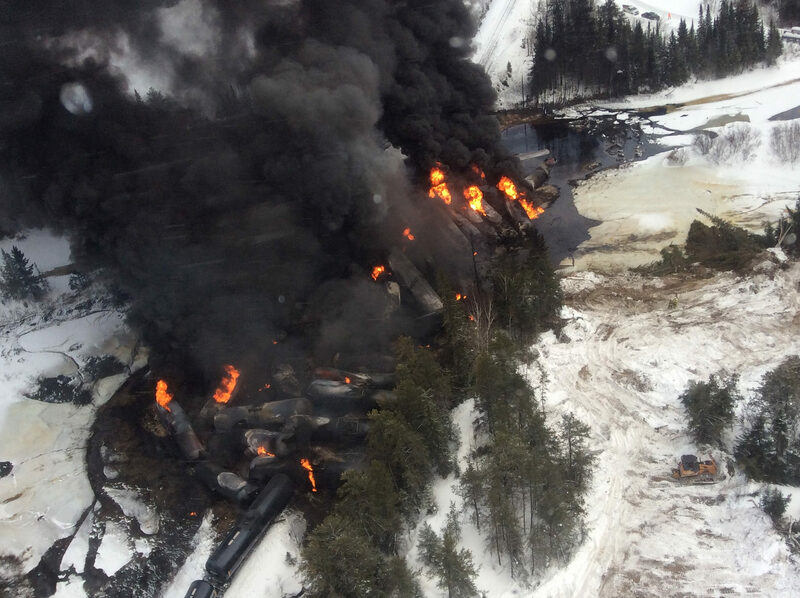 They don’t seem to realize that forcing oil companies to ship crude via rail is making everyone less safe. Until we can be oil-free we’re going to need ways to move the oil and common sense says we should choose the safest way of doing that. Today, that means pipelines. A pipeline leaked and led to an explosion in Bellingham, WA. The trains, tankers, rigs, and pipeline disasters will continue as long as you keep filling your car and heating your house with it. Every gas/diesel refill of your car is a “vote” to continue that industry. You’re voting “Yes”, while your saying “No”. If you want your actions and your words to be the same, then you must stop filling up with gas/diesel now. You can walk and bicycle now. Start adapting your car to use hydrogen from water, or replace the engine with an electric motor that is powered by a hydrogen fuel-cell. Other clean renewable energy technologies exist. Yes, this will take hard effort. You might even have to involve your greator community of concerned citizens. But, you are doing that already if you are out there actively protesting these things. The problem is not the pipeline but putting through sacred burial grounds. Just reroute the damn pipeline around the reservation.